This database driven design went online March 5, 2008. Please see the Purpose and Scope page for additional information. Current updates of the work on this website and database are listed below so please check here regularly for recent additions. Statistics: 2470 record labels, 10,078 individual records, 13,394 images of labels, sleeves, artists, etc. Local Long Play 33 1/3 Albums have been added to the database gradually over the last couple of years. There are now well over 200 albums listed and more being added on a regular basis. These are mainly bluegrass, family gospel and country music but there are also some garage, gospel and rockabilly included. Rusty York at Jewel Records produced 100's of LP's and RITE, QCA and Artists Recording all catered extensively to the custom LP market from the 1960's to the 1980's. Albums can be found at the end of each label listing and they are mixed into any searches or listing by artist, label or pressing plant. For a section dedicated to just the LP album listings, please CLICK HERE! This section can be resorted by Label, Artist, Pressing Plant and Year. Statistics: 2448 record labels, 9904 individual records, 13,372 images of labels, sleeves, artists, etc. Statistics: 2313 record labels, 9221 individual records, 12,021 images of labels, sleeves, artists, etc. Ohio Labels added since the last update include: 2nd Metropolitan, Alfa, All Gospel, B & M, Beth, Caribi, E & J, Effort For Christ, Everite, Gateway (70's), Globe International, Gold Stars, Golden Dawn, Gospel Empire, Gospelaires, HAS, Huntsville, J J P, Jodel, KB's Enter Prize, Landmark, LGS, MBL, Meco, PDJS, Peace (OH), Peltro, Portrait, Solid Foundation, Soul Mine, Tabernacle Baptist Church, The Defenders Quartet, Travis and Wally Wo-Ho. Indiana, Kentucky and West Virginia labels added since the last update include: Albun, Bogan, CB (IN), Chestnut, J & M, K-Y, Mar-Bill and Midway (WV). Record labels added since the last update from Other States are: Allin, Allison, BSP, Dessa, Echo (IL), GBS, Hall, Harleys, Job's, Mozark, Mudwerx, Parliament, S Green, Sout Temple Of God, SST, Startown and Tren Dell. Labels with significant updates or additions include: Air, Alcar, Blue Onion, Bounty, Carlco, Century (WV), Fink, Geauga, Ken-H, Pinewood, Spin (OH), Tela-Star and Vetco. Statistics: 2254 record labels, 9036 individual records, 11,615 images of labels, sleeves, artists, etc. Ohio Labels added since the last update include: Bratka, CON-E, Eastern Gates Quartet, Empirical, EP, Freelance (Dayton), Full Gospel Echos, Joy, Justine, Lil Roger, Mar-Tone, Midwest Gospel Sound, Peace, Radio Artist, Revivial Tone, Rhythm, RSM Recordings, Rudo, Serenade, Songs Of Pentecost, Spin (OH), Spur (OH), Star (OH), Sugar, The Entertainers, The Melody-Aires Quartet, Timbre Creek, Tobar and Wil-Lane. West Virginia labels added since the last update include: Burlington, Cherokee (WV), Galileans, Gay, Harrah, Hearthside, Laurel, Moigo, Morning Glori, North View Methodist, Rhododendron, Souvenir and WCAW. Kentucky and Indiana Labels added since the last update include: 3 Rivers, Carnation, Co-Jo, Cross, Franklin, Good-Will, Hi-Hat, LHS Recording, Redwood City, Sky-View and Steeltown. 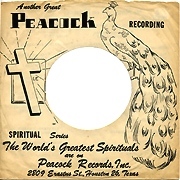 Record labels added from Other States are: Aegis, Ballad, Bell (TX), Big City Sounds, Bil-Co, Chance, Checker, Chess, Cobalt, Columbia World, Creative Artists, Dallas, Deacon Blakely, Dyno, Farmer City Music Hall, Golden Cross, Gospel Time, Kennedy Recording, Mar-Ja, Mar-Keys, Mighty Golden Tones, Missionaires Quartet, MM, National Sound Fair, Nite Riders, Pearce, Premium, Radio, Rebel (CO), Reka, Review, Spur, Starmount, States, Studio 7, The Riots, Tram, Trumpet (MS), United, Vee-Jay, Westmont and WJOL-WMRO. Many labels have also had significant updates and additions as well. They include: Airtown (IN), Alta, Cabut, Cozy, Crescendo, Fireside, Lark (MI), Redwing, Emperor, Ken-H, Marbone, Metropolis, Patrice, Pearl, Pinewood, Radio Ridge, Showboat, Sun-Ray, Triple A and Unicom. Statistics: 2239 record labels, 9002 individual records, 11,538 images of labels, sleeves, artists, etc. Statistics: 2172 record labels, 8763 individual records, 10,975 images of labels, sleeves, artists, etc. Shaw Record Processing has been added to the list of local pressing plants thanks to the daughter of the founder of the company, George Weitlauf. Although only in business for seven short years a remarkable amount of important recordings were manufactured at Shaw including nearly the entire catalog of Chicago's legendary Chance label as well as most of the early Sun pressings. All of Elvis Presley's Sun 45's and 78's have Shaw account numbers in the deadwax. Surpisingly for a company that closed in 1956, many of the original company documents still exist today. In the early 1950's, Shaw was a logical choice for small record labels in the midwest to have their records produced. Check out the Shaw story and watch for more Shaw pressings to be added to the discography. Statistics: 2158 record labels, 8698 individual records, 10,877 images of labels, sleeves, artists, etc. Ohio labels added since the last update include: A-B Sacred, Cajun, Da-Wood, Ebbe, Findlay Recording, G & R, Gospel Recording Service, Gospel Soloist, Harlequin, I-Dee, Isabel Moore, John A Epling, Judo Jim, Kogan, Maramont, Mark-Jay, McGlothens, MGRS, Production Unlimited, Quiggly, St. Teresa, Seatbelts Fastened, Sunset Trail, Tamper and The Branham Family. Here's the labels from outside of Ohio that were added since the last update: Bastille, Brown (OK), Camark, Cattran-Schooley Quartet, Citation (MA), Citation (MI), Comet (TX), Concord, Country Life, Dolly-O, Family Four Quartet, GRS Recordings, Harvest Time, J-B Williams, Jubilee (NC), L S Phreaque, Mike (NC), Mo-Doc, Moon (VA), Music Shop, Okie, Playa, Pilgram Wonders, Progressive Productions, Sound (MI), Sunar, Trumpet, Twin Town, Vale and WNC. These existing labels have significant additions of images or information: Acme, Acorn, Airway, Ark, Baron, BES, Bounty, Bryte, Bur-K, Canton, Clearhill, Fabar, Fairdale, Harp, Jalyn, Jewel, Mo Do (NY), Mus-I-Col, National, RCM, Redbug, Rite, Rose (Vandalia), Roy, S S S, Shenandoah and Sterling (MA). Another interesting announcement will be coming soon! Statistics: 2104 record labels, 8529 individual records, 10,377 images of labels, sleeves, artists, etc. Ohio Labels added since the last update include: All Time Country Hits, Big Add, Black Cat, BOS, Briggs, Broadstreet Choir, Burke, Capitol City, Cincinnati Council, Cincy, CLB (OH), Clevetown, Cookin, Country Gospel (OH), Country Pop, Donna Murie Sings, Faith (OH), Gideon, GMT, Gospel Melody Trio, Groove (OH), Indian Head, Janie, Jer-Erl Productions, Love, Marshall (OH), New Image, Olympia, Pride, Rite Record Productions, Rugg-Ed, Sacred Tone, Songs Of The Redeemed, Sowa, Spring, The Cherry Fogg, The Harvest Chapel Singers, True Gospel, TWS, Unlimited Sound, Vacation Land and Woodshedin'. West Virginia labels added since the last update include: Beck, Bicycle, Blue Hill, Blue Star, Carpenter's, Chapel (WV), Colonial, D & R Recording, Dillons Run, Echoes Of Faith, J R Clevinger, Kanawha, Kobie Recording, Lynn Kaye, Magic Valley, Magna (WV), Mojos, Moonshine, Orbit, Pinnacle, Reporters Quartet, Stage 4, Superior SSE, Sweetsong, The Harmonaires, The Servants Quartet, Upland, Upper Room and Victory. Kentucky and Indiana Labels added since the last update include: America Gospel Singing, Classic, Country Gould, Ethelda, Graco, Inspirational Four Quartet, Mary Carter, Mountaineer (KY), Pine Mountain, Quitz, T P Recordings, Tanoan, The Journeymen Sing, The Southlanders, W VA Ramblers and WIB-Records. Record labels added in 2011 from Other States are: Big Scott, Broom, Choco, Chuck Garner, Country Gems, Country Groove, Country Stream, Del-La, Delphia, Delta (MI), Domino, Edna, Erie, Kenn, Lant, Lucky Star, Marc, Mellow Tone, National, Olshevski, PEP, Pointer, Queen Vee, Rainstar, Rally, Rene (PA), River Road, Sage (MO), Sahara, Sea Jay, Sound & Stage, Star-Dale, Starr (IL), The Un-Predict-Ables and Tyro. Many labels have also had significant updates and additions as well. Thanks again for all the generous contributions by many of you to this continued effort to document local artists on local labels of the Ohio river valley plus those who had their records pressed locally by Rite, King and QCA. This project has gone way beyond my wildest expectations and it seems we are only scratching the surface of what was produced locally during the "Rock & Roll" era. Looking forward to a fun 2012! Magnetic Studios, Columbus, OH is one that has confused me for years. If there is a system to it please explain it for me! Also if you know of any listings I could add to it (currently 23), please share that as well. I know nothing about this next pressing plant. It is NR (Unknown). For years I have seen a recurring pattern in some of the releases from the 1970's and finally realized it represents a unique record pressing plant but I have no idea of it's name or location. NR (Unknown) must be near Ohio based on the location of the records they pressed. All the matrix numbers are in chronological order and start with the capitol letters NR. PLEASE! Contact me at dan@45rpmrecords if you can help identify the name and location of this 1970's-80's record pressing plant! Statistics: 2073 record labels, 8401 individual records, 10,028 images of labels, sleeves, artists, etc. I will list the labels added this year in an upcoming posting. Statistics: 1982 record labels, 8035 individual records, 9400 images of labels, sleeves, artists, etc. During 2010 we were able to add 400+ record labels, 800+ record listings and 2500+ images to the database. We also added several new pressing plants including Kay Bank, Boddie and Artist's Recording Company. The Company Sleeves section and the first sound clips were also added to the web site during 2010. Thanks to all of you who have assisted with this site for your generous contributions of information, images and time! Labels added since the last update include: Action (TX), Artane, Artists Recording, Bousman, Cousin Johnny, Crystal (OH), Disc-O-Tek, Don E Miller, Ebko, Elmo, Ewing, Gypsy, Hojo, I T Verdin Co, Jay-Sum, Marq, Mathias Bros Trio, Ohio (Hudson), Pacer (OH), Pleasant Valley, Raby, RAM (OH), ReeFlair, Serene, Southern, Spiritual (OH), Steamer Delta Queen, Talk Of The Town, The Revelators, Top And Bottom and Torch. B-W and Olimpic had major updates of images and information. Other labels with significant additions of info or images include: Acorn, Basic (KY), Bluegrass (KY), Carma, Carter, Century (WV), Fine Art, Fraternity, Gateway Top Tune, Jalyn, Jewel, Jimbo, Karen (MO), Laurel Leaf, Lin, LOY, Mus-I-Col, Opus, Pine Tree, Prix, Raven (VW), Razorback, Red, Reed, REM, Sage, Scott, Sun-Ray, Tagg, Tags, Van and Westwood. Statistics: 1951 record labels, 7946 individual records, 9188 images of labels, sleeves, artists, etc. Labels added since the last update include: Audio Adventures, Audio Lab, C-Way, China White, CY, Dayton Harvesters Quartet, Deskins, DoLeJo, Freeman, G-T, Gas Lite, Grace Melody, Grenoble, J & W, Jewel Record Co., Kinfolk, Kings Highway, Mastertone, Melody Masters Quartet, Mishawaka, Mound, Murphys Law, Neon, Noka, Oak (OH), Old Timer, Pilgrim, Revelation Records Ltd, Silver Streak, Spirit of Harmony and TeemA. Significant additions to existing labels include: Anderson, Blank, Bur-K, Bounty, Bryte, Cabut, Canon, Century (WV), Country Corner, Cowtown, Dupree, Fraternity, Globe Star, Harp, Homestead, Hull, Jalyn, Jay-Kay, Jewel, Kale, Karmony Ltd, Lunar, Master, Melody, Miracle, Mountaineer, Mus-I-Col, Music Mountain, New Song, NOW Gospel Sound, RCM, Reed, Spinner, TTHB, Vetco and Zipp (among others). Statistics: 1920 record labels, 7855 individual records, 8932 images of labels, sleeves, artists, etc. Labels added since the last update include: A & A, Amber, Bano, Bill Cobb Trio, Campus, Celest, Colsam, Colt 45, Danville, Dash, Dixie (KY), Forest, Forest City, Gem City, Harmony Stars, Lanier Smith Presents, Liverpool, Loral, LOY, Lunar, Northside Music, Parllament, Raven, Rue, S Reece, Spur, SR Production, Thrill, Trey and Truth. New labels featuring Company Sleeves include: C & D Record Bar, Jimmie Skinner Music Center, R-Dell, Rendezvous, RPM, Smash plus additions to Decca and RCA Victor. Major improvments have taken place at Rusty York's Jewel label showing an integration of various labels in a single numbering system as Jewel Recording Studio issued releases. I've had a gap in activity on this web site as a result of creating several web sites for customers and going back to school to prepare for a career change. My career change is currently held up by the Christmas holidays so I've had a chance to get some work done on this web site again. One of the things I've wanted to accomplish is learn how to digitally record some of the music represented here. The first recordings from my basement record cave are now beginning to appear on this site. Check them out: Arrow, Cozy, Fran, Link, Sterling and Winkler. Thanks again for your continued flow of contributions to this site and to all of those who visit! Statistics: 1884 record labels, 7733 individual records, 8678 images of labels, sleeves, artists, etc. Individual labels of records (excludes those that only list company sleeves) that have been added since the last listing include: Allegro, Amateur, Annthonette, Bee-Gee, Bee Jay, Big J, C & C, Carillon, Chance, Clay, Com-Ette, Continental Promotions, Convertible, December, Delsey, Dixon, Dyna, Dynamic Sound, Ecbolic, Em Kay, Evergreen, Four-B, Flame (OH), Garnett, Gino, Gulf State, Gun, Jack Rhodes, Memory (LA), Maranatha, Moon (TN), Pamela, Peninsula, Pork Knuckles, R&B, San-Dus, Sanwayne, Seven Hills, Sonic (IN), Sound (TN), Star Recording, Tiara, Twilight, Us Too, Van, Vicki, Victan, VOTH, Waves Of Faith, West Virginia 4-H, White Horse and Zebb. Existing labels with significant additions of images or listings include: Adco, Applegate, B-W, Big 4 Hits, Blue Ash, Bounty, Elvitrue, Emperor, Excellent, Fee Bee, Gateway Top Tunes, Jewel, Kentucky, Raven, Vetco and Western Chuck-Wagon. Statistics: 1844 record labels, 7659 individual records, 8399 images of labels, sleeves, artists, etc. I've shown a pattern in the past of less work on the website in the summer when the weather is nice than in the winter when there's not so many activites to distract from this hobby. Apparently it's starting to set in again this year although to a lesser degree than last. As always, there's a large backlog of info to be added to the site - THANK YOU to all who have contributed images and data in April and May! Some of the new info has been added to the site but much is still to be done. Company Sleeves has been a recent labor of love. As mentioned earlier, I've collected and cataloged these separately from the records they once contained for over 30 years. The layout and design of this new area of the website has been tweeked and improved several times over the last month and many more sleeves have been added. You can now view this section as a Picture Gallery or as a Label Listing. Of course, it's woefully incomplete at this point with many major labels having only token representation or not listed at all! All labels large or small, listing vinyl or company sleeves (or sometimes both) are included in the Master Label Listing. I'll list the individual labels that have been added recently in the next posting. Thanks again for being interested enough to read this! Statistics: 1802 record labels, 7638 individual records, 7981 images of labels, sleeves, artists, etc. Added nearly 60 labels and 400 images to the website in the past month while building a new section of the website - Company Sleeves. Company sleeves were issued by most major and many smaller record labels to promote their label (or brand) on new records for sale. Over the last 35-40 years, while collecting over 50,000 45's (plus a few thousand albums and 78's), I've also managed to acquire over 15,000 company sleeves. Some of the more common ones have been used as sleeves for records in the collection while less common examples have been kept in a special file. Since the late 1980's I've kept a master file of the best example of each sleeve including every variation I could identify. This master file now holds nearly 800 unique sleeves. A small selection of these sleeves has been displayed on this site since the current website design was launched over two years ago. Now it's time to move forward with this part of the website. During the last month I've struggled to create the design and scripting for these beautiful sleeves to be included as an extension to the existing database. The struggle also included getting it to work correctly across various web browers such as Firefox, Internet Explorer and Safari. The Company Sleeve Homepage displays all sleeves in the sleeve database as a gallery with 25 sleeves per page. You may click on each image to pop up a large image of that sleeve. You may also click on the name of the label below each sleeve to go to that label's page. There's now about 100 classic sleeves on display. Statistics: 1744 record labels, 7593 individual records, 7585 images of labels, sleeves, artists, etc. Labels added recently include: Alco (Cin), Applegate, Basic (KY), Blue Ash, Carter Country, CFP, Circle J, Colson, Country Gospel Singing, Curtain Call, Derbytown, Dynamic, Fine, Golden Shield, H & S, Hamlet, Humming Bees, Insight, JLB, Jopz, Keys, Little Willie, Maggio, Magic, Marathon (OH), Marigold, Miranda, NRS, Pee Jay, Peyton, Phuz Street, Rex, The Chordians, The Ranchero's, Starr Productions, Suds, Sundown (KY), VAR-1, Varsity, Vine, Wenlo, Wham and Wurlitzer Company. Existing labels with significant additons of images or listings include: Acme, Alco, Ben, Delta, Huron, Lemco, Liban, Luau, Marlee, Melody, Nabor, New American, Pearl (IN), Soul Kitchen, Tammy, Tela-Star and White Star. Making slow but steady progress as I try to type listings and add label images almost daily. Still way behind but please keep the info coming! Thanks for those who wished me well with the leg. It is doing well and the swelling is nearly gone. Thanks again to all recent contributors many of whom are first timers including a few original label owners! Lots more Archer pressings to be added next! Statistics: 1702 record labels, 7516 individual records, 7349 images of labels, sleeves, artists, etc. Whoops! I broke my leg Friday evening. Hard to type on the computer and keep it elevated at the same time but I'll see if I can manage. New information continues to come in faster than I can add it to the site but I keep plugging away. I apologize to those who sent photos and listings and only see some of their info get on the site. I haven't lost it and I will go back and get the rest on the site eventually but I'm trying to put some of everybody's stuff on in a timely way. Again, THANK YOU to all who have taken time to add listings, images and corrections to this site. My first goal is always accuracy. In-hand records provide the most accuracy, images of record labels with complete matrix info are next best. Depending on the source, data with no visual confirmation may always be susceptible to errors. That's why label images are included on the site whenever possible and are constantly being added to existing listings that did not originally have images. I'd like to welcome new contributors, Tammy Clemons and Timi Reedy. Timi is the grandaughter of John and Frances Reedy who recorded for Ark, Jalyn, Jewel, REM, Viola and their own John Reedy label from Dayton, Ohio among others. Their initial contributions are significant and promise more to come. Please check out their "Remembering The Reedy's" blog! The dating of Rite pressings has come under scrutiny lately as more Rite pressings have been discovered and documented. Some of these have dating clues such as recording or release dates on label or matrix, dates coded into the label number, Christmas songs or other songs that are based on actual events and Billboard reviews or ads. As a result of this additional information as well as similar work by other discographers, the Rite Dating Matrix has been updated and all Rite listings on this site have been corrected to reflect these changes. As many record labels used multiple pressing plants for their releases, this will improve the dating for other record pressing companies as well. Labels added recently include: Abiding, Albee, Alderay, Angry Red, Bassment, Berea-St. Paul Church, BET, Big City, Black Soul, Blue Rose (MI), Clean Note Music, Day-Wood, Dazia, Eli, Eye-Ball, Fish Communications, Gospel Recordings, Innersounds Of Grace, J & Martin, Jitney, Kandy, Karmony Ltd, Keen Keener Keenest, KOW, LaTrice, McClain, Marion, Metroplex, Nowonder, Olivarez Brothers, Pro-Gressive Productions, Rays Of Hope, Shirleo, Sound Patterns, Tema, True Gospel, Vulcan, Warmland and WTVN / 610 Radio. Existing labels with significant additons of images or listings include: AMG, Bel-Kay, Bounty, Bur-K, Century (PA), Cozy, Jalyn, Jewel, K Records, Kasko, Melody, Nabor, Pinewood, Pork, Process, R-J, Shippings, Soul Kitchen, Spangle, Sulkie, Terry and Wam. Statistics: 1663 record labels, 7426 individual records, 7207 images of labels, sleeves, artists, etc. Spent quite a bit of time over the last few weeks on several different projects to do with this site so there is a little less new labels and listings recently than usual. 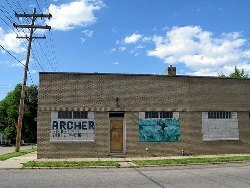 One of the most interesting projects is working with Ben Blackwell in developing the discography of the Archer Record Pressing Company from Detroit, Michigan. Archer started pressing records locally in 1965 and is one of the few remaining vinyl record manufacturers still operating today! They pressed some early Detroit soul and funk and were involved at the very inception of rap and techno musical styles. As you can tell by the recent photo, it is truly a step back into the time we all enjoy! Labels added recently include: Arsis, Blackman, Capriccio, CLC, CLW (IN) COGIC, Demo Ristic, Dollamar, Gates, Gatewood, Get Down, Glass City (OH), God's City's Sounds, Gordoon, King Soul, Leo, Lobo, Magic City, Marathon (TX), Miracle (GA), Motor City, Raido, Rebel (TN), RS (MI), SOL, Ticket CC, Tru-Ba-Dor, Universe and VFHL. Existing labels with significant additons of images or listings include: Action, Anderson, Arch, Arco (MA), Art Flow, Big Star (MI), Bobby Jacobs, Boney, Cane-Break, Century (PA), Chetwyd, Clay-Ro, Conteste, Country Jubilee, Cozy, Demo, Fad, Glass City, Jessup, Joey, Klub, Maarc, Peachtree, Philmore Sound, Process, Reuben, Saga, Venus and Walton. Had some new contributors join the group recently - welcome! Thanks to all for adding to the site, for visiting the site and thanks for reading this! Upgrade complete! The record labels data table (all 1635 of them) were individually modified and 583 web pages were created for all record labels that are not from Ohio, Indiana, Kentucky or West Virginia. This allowed new php code to be inserted in all main pages so all record label names are now active links to their label page. There is also a new label index for all of these "Other Record Labels" which are pertinent mainly because they were pressed locally. Moving around the site and finding information is much easier now. All labels and listings on the website are now much more accessible. The labels section of the database is currently undergoing an upgrade that is now about 60% complete. This upgrade will make all label names a hot link to their corresponding label page. It will work from all pages containing database information including pressing plant discographies, the master record label listing, query results, artist listings, etc. It also requires the creation of about 560 new web pages (310 are currently completed). Watch for this upgrade to appear in the next few days! Statistics: 1637 record labels, 7362 individual records, 7068 images of labels, sleeves, artists, etc. Some upgrades have been made to the functionality of several popular pages including the Record Label Listing, Ohio Label Listing, and the Rite Pressing Discography. You may now re-sort all the data on those pages by clicking the different column headings. Please note, when re-sorting the Record Label Listing by anything other than label name all labels with blank data in that field will be omitted. Newly listed local labels include: Belgrade Enterprize, Busse, Chamberhouse, Epoch VII, Exit, Falcon (OH), First, Forester, Golden Keys Quartet, Gospel Travelers, Grace, Harmony, Nation Records, Opp Search, Orchard, Pama, Patio, Radio Ridge, ROK, Sherry Lincoln-Mercury, Skyland, Songs For Sale, Southern-Aires and The Crockett Quartet. Newly listed out of area labels include: Big Mack, Blue Heart, Caveman, Cavern, Chapel (NC), Charlie & Bill, Deb (TN), Doris, Echoes, Excel, FAAP, FCM, Glendale, Helene, Hitch Hiker, Hymntone, Jay Vee, Jockey, Joyce, Kain, Karen (MO), Marauders, Midway, MOD, New-Hope, P-C, Peachtree, Podge, Radio-1, Rush, Sand, Seven Teen, The Fugitives, Vel, Western Chuck-Wagon and Wren. Existing labels with major additons of images or listings include: Arrow, Bobby, Candee, Carma, Clark Country, Country Label, Del-Nita, DerbyTown, Future, JAG, Mir-A-Don, Nabor, Rocket, Sterling, Thoroughbred, Tony-Jay, VLM and several others. Many early King pressings (all with label images) have been added this month. I have a box of about 200 King pressings I will be adding to the site over the next few weeks. I only list King pressings that have verified Account #'s. Early Account #'s below 700 are only found in the matrix (180 degrees opposite from the matrix numbers) and are not printed on the labels. WANTED: Account #'s for early King pressings not listed in this discography! Thanks again for all your help!! Statistics: 1576 record labels, 7237 individual records, 6884 images of labels, sleeves, artists, etc. Newly listed local labels include: Aztec, Big Star, Calcomo, Cap-Town, Deb (IN), Derby Town, Donnie, Drifter, Floyd, Fly-By-Nite, Gem, Gospel Harmony, Indie, JAG, Keno, L & W, Lavender, Ray-O, Riley Family, RLB, Rozan, Sage Inc, Sam Orahood, Sovereign Grace, Sandwash, Spider, Tammy Jo, Timken, Tone and Tony-Jay. Newly listed out of area labels include: Audio Dynamics, Cane-Break, Cavern (MO), CAVU, Cepro, Clay-Ro, CLW, CMP, Corillions, Country Fresh, Courtesy, D-J, Diplomat, DonBut, eEe, Glenn Kelley, Go Records, Greenley's, Hawkins, Hound, Hugo, Joker, Ladd, Mersey, Mesa (TX), Moonbeam, Poison, R-J, Rainbow, RAM, Ramble, Redstone, Rocket (MO), Rondon, Royal American, Smith's, Soultrack, Spec, Sun-Rise, T-Town, Tee-Cee, Teek, Terra, The Galaxies, TRU, Turn-Tage, Turntable, Twilighters Quartet, Ultrasonic, Unicorn, Universal, Venus and Von. Existing labels with major additons of images or listings include: Cosmic, Cha-Tok, Dial, Dess, Dessco, Fairdale and Gospel Jubilee. Statistics: 1571 record labels, 7225 individual records, 6866 images of labels, sleeves, artists, etc. During 2009 we were able to add 500+ labels, 2000+ record listings and 2700+ images to the database. Thank you to all of you for your generous assistance in these accomplishments. Let's see if we can match it in 2010!! Please click here to view website and database updates from 2008 & 2009.